Heartgard Plus is used to protect dogs against heartworm, which is a parasite transmitted by mosquitoes that can cause serious health problems that can result in heart failure and eventually death. Heartgard Plus is also used to treat and control roundworm and hookworm, which are both intestinal parasites that are transmitted when a dog ingests its eggs from the environment such as the soil, or transmitted to puppies while still in the womb, or to nursing puppies through infected milk. Both infections can cause serious health problems for your dog; roundworm deprives dogs of essential nutrients and may cause intestinal obstruction and hookworm feeds on the intestinal wall, causing significant blood loss. Heartgard Plus kills these parasites breaking the parasitic lifecycle and protecting your dog from serious and life-threatening illness. 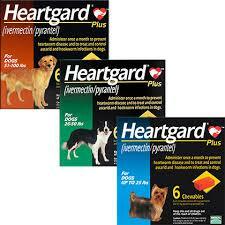 Heartgard Plus contains two active ingredients; ivermectin an antiparasitic drug and pyrantel, a deworming agent. The larval stage of the heartworm is transferred into the blood of the host dog when an infected mosquito bites the dog; the larvae then enter the tissues and migrate to the heart and lungs where they mature into adult worms causing tissue damage which can be fatal. Ivermectin in Heartgard Plus acts of the nervous system of the larval stage of the parasitic heartworm and causes paralysis and death before it reaches the heart or lungs of your dog. Pyrantel in Heartgard Plus is a neuromuscular blocker that paralyses roundworm and hookworm while they are feeding in the dogs’s intestine, so that the parasitic worms lose their grip on the intestinal wall and pass out in the dog’s stools. Heartgard Plus contains ivermectin, an antiparasitic drug that is used to protect dogs against heartworm, which is a parasite that can cause serious health problems that can result in heart failure and eventually death. Heartworm is transmitted by mosquitoes and the larval stage is transferred into the blood of the host dog when an infected mosquito bites the dog; the larvae then enter the tissues and migrate to the heart and lungs where they mature into adult worms causing tissue damage which can be fatal. Ivermectin in Heartgard Plus acts of the nervous system of the larval stage of the parasitic heartworm and causes paralysis and death before it reaches the heart or lungs of your dog, breaking the parasitic lifecycle and protecting your dog from serious and life-threatening illness. Heartgard Plus contains pyrantel, a deworming agent that is used to protect dogs against roundworm and hookworm, both of which are intestinal parasites transmitted when a dog ingests its eggs from the environment, such as from the soil, or transmitted to puppies while still in the womb, or to nursing puppies through infected milk. Pyrantel in Heartgard Plus is a neuromuscular blocker that paralyses roundworm and hookworm while they are feeding in the dogs’s intestine, so that the parasitic worms lose their grip on the intestinal wall and pass out in the dog’s stools. Heartgard Plus kills these parasites breaking the parasitic lifecycle and protects your dog from serious and life-threatening illness. Following the use of Heartgard Plus, digestive and neurological side effects have rarely been reported, including: vomiting, diarrhea, hypersalivation, excessive dilation of the pupil (mydriasis), staggering, convulsions, lethargy, loss of muscle coordination (ataxia). Ivermectin in Heartgard Plus is effective against the tissue stage of heartworm larvae for a month and therefore you should give Heartgard Plus to your dog once a month (every 30 days), one month before the start of the mosquito season to one month after the last exposure to mosquitoes. If you miss a dose of Heartgard Plus and forget to give your dog their monthjly chewable, you should give one as soon as you remember, as the effectiveness of Heartgard Plus begins to wear off after 30 days and your dog may be at risk of reinfection. You should store your dog’s Heartgard Plus in a cool dry place below 25°C and protect from direct light. Heartgard Plus is a monthly oral pet med used as a combination heartworm preventive and intestinal wormer for dogs and puppies over 6 weeks of age. Safe for pregnant/breeding females. Heartgard Plus is used in the prevention of heartworm infection and the control and treatment of various other worm infections. It kills the immature form of the heartworm (Dirofilaria immitis), which is transmitted by a mosquito. It is also used for the treatment and control of hookworms (Ancylostoma caninum, A. brasiliense, and Uncinaria stenocephala) and roundworms (ascarids - Toxocara canis, Toxascaris leonina). Tri-Heart Plus and the Iverhart Plus are branded generic alternatives to Heartgard Plus and should be interchangeable as long as the doctor does not indicate "dispense as written". Heartgard Plus must be administered monthly, preferably on the same date each month. Drs. Foster and Smith recommends (and our guarantee requires) that Heartgard Plus be given year round, although some veterinarians may recommend giving it only during the mosquito season. If given seasonally, the first dose must be given within 30 days of the dog's first exposure to mosquitoes. The last dose must be given within 30 days after the dog's last exposure to mosquitoes.